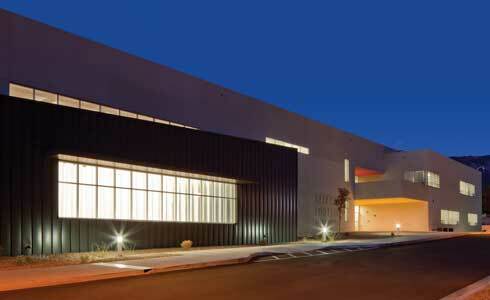 Architect Jon Anderson’s buildings mirror the distinctive aesthetics of Albuquerque’s striking environs. Above: The George I. Sánchez Collaborative Community School. AFTER JON ANDERSON moved to Albuquerque in 1970 to study architecture at the University of New Mexico, he hopped in the car every chance he got to make the 45-minute drive up to two-mile-high Sandía Peak. He had grown up in flat country—Illinois—and started college in Wisconsin. “The difference between the Midwest and here was shocking,” he says. “I spent every minute I had driving around the state.” He couldn’t get enough of the views, the light, the space. Georgia O’Keeffe Elementary School show contrasting shades of Anderson’s palette. Today Anderson is one of the state’s top architects, and that craving for visual New Mexico still shapes his home designs, and many of his commercial buildings as well. 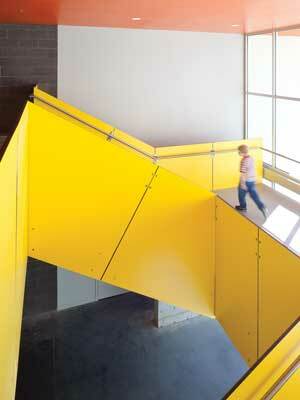 Anderson typically renders them in the sleek clarity of steel, concrete, and glass. From the inside, walls disappear in windows. The Flyway View House in Albuquerque’s North Valley, for instance, merges with the nearby—the sprawling fields of the Rio Grande Nature Center, often aflutter with migrating cranes and geese. In Rio Rancho’s Mariposa neighborhood, Zach and Susan Bryan’s home gapes at the faraway—the vastness of central New Mexico, all mountains and mesas and a soaring vault of sky. 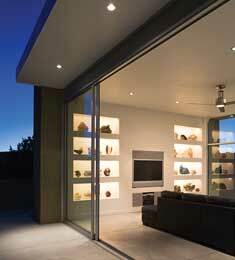 Sliding open glazed double doors completes the unification of indoors and out. Interior meets exterior at the new Bryan home in Rio Rancho. 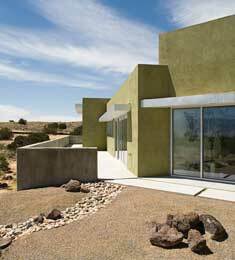 Hewing close to that philosophy, Anderson has crafted a modern-inflected, place-centered architecture in New Mexico. Some might say a modern influence cuts against the grain in a state whose architectural legacy reaches back a millennium and more. Anderson sees it differently. Although each of his 70-some projects occupies a design niche light-years away from the fuzzy edges and wavering lines of adobe construction, Anderson’s work remains true to the spirit of place and offers an honest—even loving—response to the culture, the geography, and the light that make New Mexico unique. Mild-mannered and relaxed, given to wearing black T-shirts and work boots, the 65-year-old Anderson is quick to laugh, slow to divert attention to himself. If you met him cycling with his wife, Laura, on the nearby Paseo del Bosque bike path, a common pastime for this active couple, you’d never guess that he ranks among the most acclaimed New Mexico architects—and this is a state of great ones, past and present. Anderson wears his success and status lightly, but his work has earned him dozens of awards from his peers, a slew of magazine covers, and elevation to the College of Fellows in the American Institute of Architects, one of just a half-dozen in New Mexico to have earned the distinction. A child of the 1950s, Anderson grew up 80 miles northwest of Chicago, in a fifties-modern house designed by an architect and stocked with woodworking tools. He remembers building forts, tree houses, and storage units at his father’s office building. As a teen he built a 25-foot-diameter geodesic dome, which languished for decades in his parents’ basement. 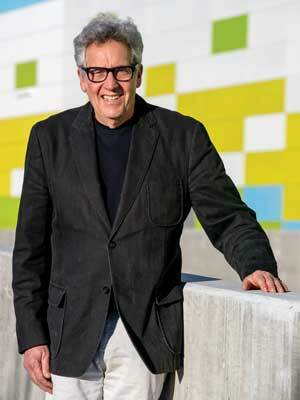 Midway through college, he decided to pursue architecture, transferred to UNM for his degree, worked in a series of firms, and eventually became a key leader of Antoine Predock’s design team in Albuquerque from the late 1970s through the early 1990s. Predock, New Mexico’s best-known living architect and regarded internationally as a leader in the field, designs often-monumental modernist buildings. Anderson oversaw projects all across the United States and Europe, learned every aspect of the trade—from meticulous design to managing a team of architects, engineers, and builders—and still found time to design homes on the side. 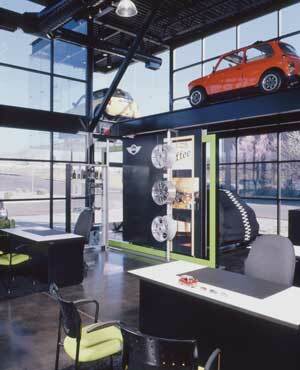 The Sandia Mini showroom, visible from I-25. Emboldened by those experiences, Anderson “charged out” in 1991, he says, formed his own firm, now called Jon Anderson Architecture, and never looked back. He started with homes, then expanded to commercial buildings. The latter include auto dealerships for Mike Houx, who owns the Mini and BMW car and motorcycle dealerships in Albuquerque and Santa Fe, and sprawling facilities for Albuquerque Public Schools. 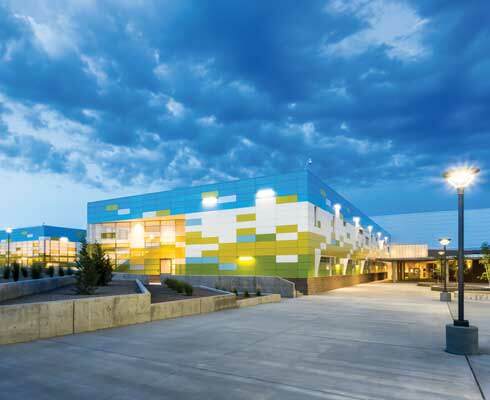 Still collaborating with Predock, Anderson was the architect of record on high-profile projects including the award-winning George Pearl Hall, home to the UNM School of Architecture. None of this work resembles the postcard, John Gaw Meem image of classic New Mexico architecture. Yet Anderson finds no contradiction of the local design idiom in his pursuit of the straight-line geometries, unusual color schemes, and sometimes frankly industrial idiom for which he is famous. He hasn’t abandoned tradition—he’s updated it by a few centuries. And he knows a thing or two about the old ways. He even paid his dues to the adobe trade during his first job with an Albuquerque architecture firm, when he helped build a boss’s home in shady, traditional Corrales. Forms meet functions at the new Sánchez School. You see that starting point in his early work designing homes in the near Northeast Heights and North Valley of Albuquerque. You see it today in his instant icon, the extroverted Mini Cooper dealership along Interstate 25, in the heart of the city. 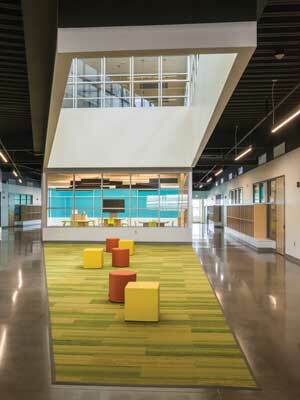 And you see it in the brand-new, innovative George I. Sánchez Community Collaborative School on Albuquerque’s Southwest Mesa. In every case, the buildings emerging from Jon Anderson Architecture faithfully respond to their surroundings and fulfill the needs and desires of his clients. It’s also an honest, long-cherished response to that view from Sandia Peak of seemingly endless light, space, and spectacular country. In a Jon Anderson home, you can bring it inside. Just as New Mexico grabbed hold of Jon Anderson and never let go, so did Downtown Albuquerque. “I moved here and just stayed,” he recalls. In 1971, friends introduced him to his future wife, Laura, at the old UNM-area watering hole Okie Joe’s, a bar known for its picnic tables, wood shavings on the floor, and pizza by the slice. Four years later, they bought a house together on a leafy street two blocks from the high-rises marking the city’s urban core. 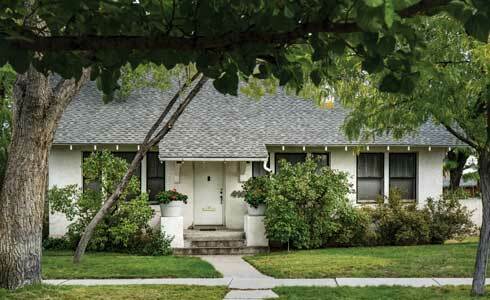 Here they raised two children and perfected urban living Albuquerque style, with everything from movies and live music to groceries and fine dining within walking distance of their cozy white-stucco, railroad-era cottage, built in 1918. 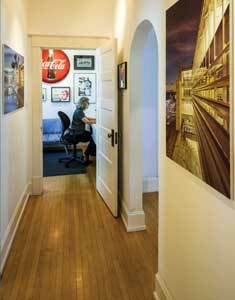 The property, now a compound, includes his company studio in the house next door and a rental house tucked in back. Anderson and wife Laura live in a 1918 cottage in Albuquerque. And yet. Look inside at the alternating black-and-white tile in the kitchen and the wide-open upstairs master bedroom, with its complicated intersection of slanting ceiling planes. Or consider the furniture. The house is full of pieces by leading midcentury modernists: A wavy free-form Eames fiberglass lounger, dining chairs by Mies van der Rohe, and couches by Le Corbusier dress the living and dining rooms. Ikea cabinets and sleek aluminum chairs rub shoulders with an original glass-front built-in cabinet spanning a corner of the dining room. A simple, almost stark fireplace divides the living room from the sunroom. You can feel modernism rising into the 20th century. Evidence of craziness: Dating to World War I, the pocket-size kitchen can’t fit a fridge, so that appliance sits in the back pantry. 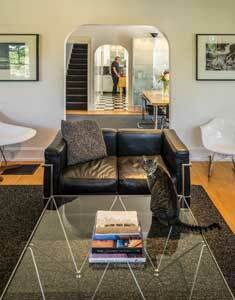 A 1935 remodel replaced casement doors with what Anderson calls “Mediterranean arches,” a Depression-era fad. During one of the Andersons’ own renovations, he peeled off cabinets from a previous remodel and found—and restored—a window looking onto the backyard. At least the coal heater is long gone. Still, the Andersons take the house as it is, respecting its historical integrity. But nevertheless, they’re building a new home. The small rental house in back will soon succumb to the wrecking ball—or sledgehammers and a Bobcat. In its place, Anderson is conjuring a super-green, stealth-modern hideaway camouflaged as a period cottage to satisfy historic design codes in the neighborhood. Inside, you can expect sleek wood and steel and an open plan maximizing the compact urban footprint. Anderson hesitates to call it a retirement home, though Laura has retired from her career teaching at Albuquerque High School. Anderson plans to keep working, commuting a few steps each morning to the office next door. “This is where I want to live for many, many years,” he says. That shouldn’t be a problem: The new house is already under way. 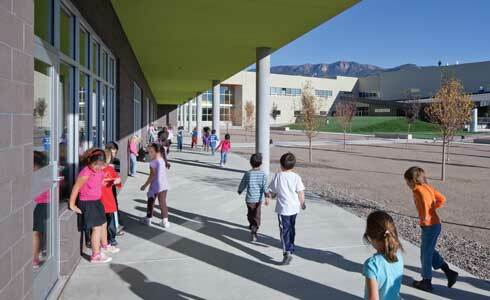 The architect at the George I. Sánchez Collaborative Community School. After Bob Ruth built three Anderson houses for clients, the contractor and his wife, Judy Griego, commissioned one for themselves. Saturated colors, intersecting planes, massive cubes lightened by Anderson’s tradmark commercial windows, and a built-in tiled chaise longue in the master bathroom set this home apart. Anderson arranged the main house, guesthouse, and outdoor spaces in intimate relation to the vast irrigated fields of the Rio Grande Nature Center, a scant few miles from the city’s geographic center. Exposed masonry, visible structural members, and laser-sharp lines express the Anderson aesthetic. Students in the school’s courtyard. A Stairwell at Georgia O’Keeffe Elementary.